Tim Crews, publisher and editor of The Sacramento Valley Mirror, has fielded his share of death threats in the 27 years since he opened the newspaper. In April 2017, an unidentified reader left a hangman's noose at the door of his office in Willows, California — an implied threat that may be linked to a local murder investigation the paper was covering at the time. The gesture was extreme enough to catch the attention of the international advocacy group Reporters Without Borders, but not enough to intimidate the 74-year-old journalist. "If you go to jail in Glenn County, if you’re arrested, your name goes in the paper," Crews told NBC News on Friday. "We report every police call. We report every accident. ... We’re the paper of record here. But not everyone wants to be in the paper of record." 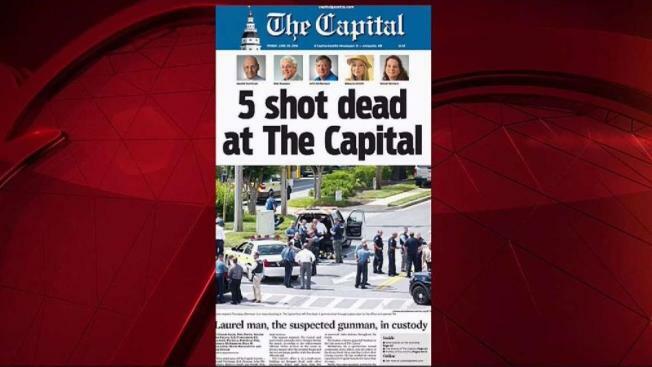 So Crews says he was saddened, but not surprised, to have to write a Page 1 editorial about the mass shooting that left five journalists dead Thursday in Annapolis, Maryland, for the Saturday edition of his 2,960-circulation broadsheet. Tim Crews, publisher and editor of The Sacramento Valley Mirror, has fielded his share of death threats in the 27 years since he opened the newspaper. In April 2017, an unidentified reader left ahangman's noose at the door of his office in Willows, California — an implied threat that may be linked to a local murder investigation the paper was covering at the time.